Anyway, it meant I could just spend the whole day focusing on the talks so I decided to try making sketchnotes for the first time. People have made sketchnotes for some of my talks in the past and I’ve loved them! So I thought, this is an awesome way to give something back to the speakers, as well as giving the rest of the world some insight into the amazing talk that they missed. If you don’t know what a sketchnote is, well, it’s exactly what it sounds like. It’s notes with sketches, basically. Think of it like a rough, on-the-fly infographic. You’ll get the idea when you see a few of them. There are many guides and courses out there to taking sketchnotes (Google it) and I was too lazy to read any of them. Some of them look amazing, and I’m glad that I didn’t look at any of those because it looks really intimidating. But I’ve seen some sketchnotes before so I got the gist, plus I’m an artist and a visual learner so how hard can it be? My first-ever sketchnote was made early in the morning (I am not a morning person so 9am is early for me) before my coffee had time to kick in. So not only was it a little rough, but you can see the fast deterioration of my own self-confidence as the sketchnote progresses. At some point it ceased to be a visual representation of the talk I was watching and digressed into a disturbing output of the negative meta-analysis of my pre-caffeinated mind. I felt really bad about these notes especially because I tried to draw Jessica at the top and I gave her one massive ear accidentally, then I tried to cover it up with hair and it looked really weird in the end. So I wrote an apology next to it and hoped for the best. I think it was a good talk. If I’m honest, I couldn’t tell you for sure because I was too busy making a sketchnote. But I do remember being really impressed by Jessica’s mis-matching unicorn socks and her hand-written visuals in her talk. Super points for style. This went a lot better. I decided that circles are too hard to draw so I drew boxes instead. Boxes rock. My brain also woke up and I really liked this talk! I love learning about psychology and UX. I think all the sketchnotes I’ve seen in the past just summarise the talk but don’t have any of the noter’s own opinions in the notes. This seems weird to me, because they’re still my notes – if I just wanted a summary of the talk I could probably refer to the slides. Capturing my experience as a listener seems like an important part of note-taking to me. So I tried to keep a bit of that in my notes. By this point I was starting to feel faster and more comfortable taking notes but I still felt like I was missing bits of the talk because I had to shift focus back to making my sketchnotes prettier now and again. I do think these notes look great, and adding little whales and other pictures made it look cool. The flow-diagram style was pretty easy for me to use so I kept using that in the following talks. I liked this talk because I have worked with teams that use Docker effectively but I have never had to set it up myself. It’s interesting to see what that journey is like. It’s also massively validating to see someone as experienced as Damian having the typical frustrations involved in setting up this kind of infrastructure. I came in late to Larene’s talk because I got caught up talking to someone in the hallway between sessions. I worry a bit that with sketchnotes, if I miss or misinterpret something then I’m misrepresenting the speaker’s talk on social media. But I think I did okay because when I came in Larene was explaining her weekly meetup feed in Slack, which is something I’m already familiar with. I like the simplicity of this sketchnote. Instead of trying to capture every little thing in the talk, I just went for the points that I thought were most impactful to me. I also waited towards the end to add more pictures, instead of trying to do it during the main part of the talk, and I think that helped me focus on the talk itself. I really loved that this talk was merging technical skill with diversity goals, and I thought it was so great to see that the room was full for a diversity talk. The audience was really engaged with the content, and the advice in the talk was really practical. At this point I really felt like I was getting the hang of this whole sketchnoting thing. I was leaving enough room for adding new elements, and I had a good feel for how to use the space for a half hour talk. By leaving more space around the elements I added, I could come back later and organise them a little better too with borders and titles. There were some good points made about feedback which I hadn’t heard before, but some of the advice reminded me of the book Radical Candor. It was a good reminder to me to finish reading this book. Sammy’s talk was really great because she’s a professional expert in recruiting women in tech, so it was great to see her answers to really common questions on this topic. As a woman, I get asked these types of questions all the time as if I should be an expert myself just because of my gender. And after a while I start to think maybe I *should* be an expert because everyone treats me like one. But seeing a talk like this reminds me that there are real experts out there who have put in a lot of work to get statistics and studies and other evidence, and it’s really good to know who that I can refer future questioners to her work when they have a question again. This one’s gone back to a simple style, and I think a lot of the reason for that is because I already knew a lot of the content of the talk so it didn’t compel me to take a lot of detailed notes. I think that’s a really interesting part of sketchnoting – you’re seeing the talk through the sketchnoter’s eyes so someone with less experience in the topic might end up taking many more notes and gaining more insights than someone who’s been working in the field for a long time. 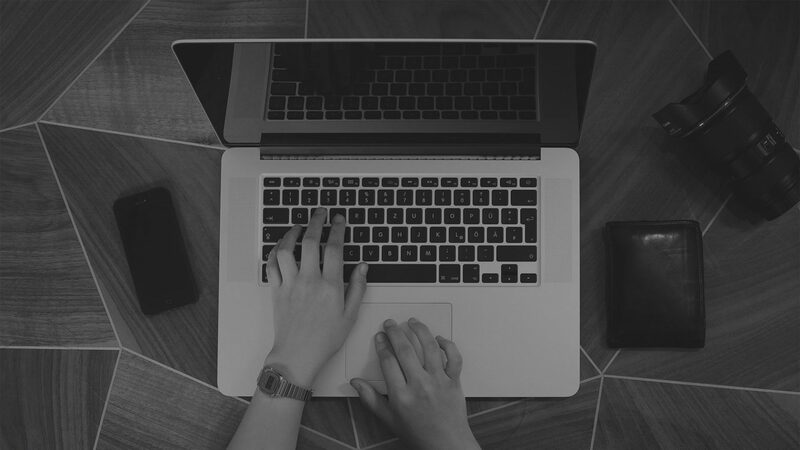 But then, maybe the more experienced folks can bring more interesting perspective to their notes by adding their own meta-insights rather than just transcribing the content of the talk? Something to think about. This was Jamie’s first-ever talk and she did really well. I could see that the developers in the room were interested in what she had to say, and she presented her tips for designing in a way that was easy to digest. I liked her big message on focusing on the user experience and I’d like to see her give another talk where she just gives repeated examples on starting from there and following through to design insights. 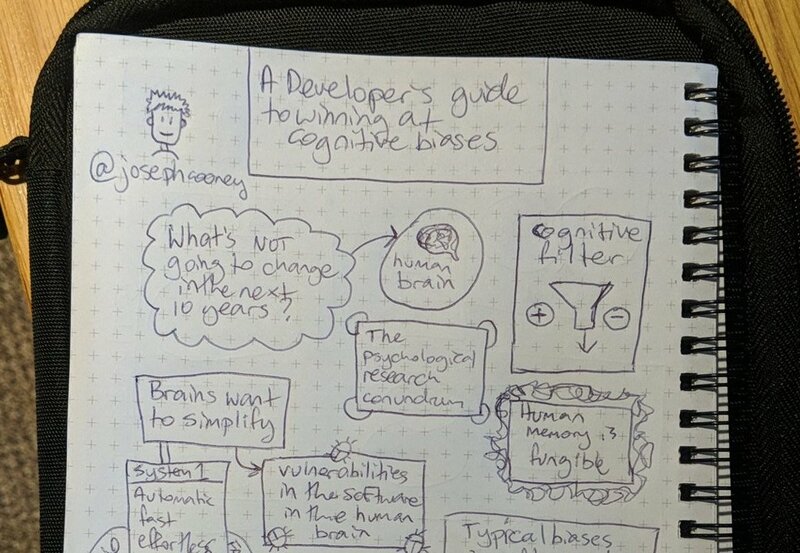 There was actually a lot of content in this talk which isn’t captured fully here because Joseph went into a lot of detail about systems 1 & 2 styles of thinking, which is information captured in the book Thinking Fast & Slow. As I’ve read this book, I just kind of summed up the high level bits of it with a nod to the book title since I know I can always find more information by reading the book again. Once again, notes that are mainly only valuable to me! Perhaps I should have explicitly called that out in the notes. In fact, several books came to mind during this talk which I didn’t mention in my notes but I think Joseph and others interested in this topic would find them really interesting. After this talk I had a really bizarre conversation with some of the attendees about whether or not the human race was still evolving. I tried to refer them to the evidence presented in Sapiens: A Brief History of Humankind, but they insisted they had their own opinions based on evidence such as which finger millennials use to push the elevator. Perhaps we were all just tired and hungry at the end of the day. Let’s go with that. This last lot of notes was a real mess because I was tired, hungry, in pain (I was suffering from awful neck and shoulder pain the entire day) and the talk was one of the most technically in-depth talks of the day. So I was finding it really hard to follow. I’m pretty sure the talk was about agile practices and continuous delivery but you wouldn’t know it at all from my notes. I could have just given up on sketchnotes for the day but I thought it would be fun to try to capture my mental process at that point in time for artistic and humour reasons. Essentially I just ended up apologising profusely. And no, I didn’t win a prize. Like any skill, sketchnoting was tricky at first but became easier with practice. I would definitely do it again because it’s fun and I think in the end it actually helped me focus on and retain the information from the talks I watched. I think next time I will try to be more true to my actual thoughts and insights from the talk rather than trying to capture all of the information for other people to see. That sounds more interesting to me. I might use a nicer pen next time too, like a gel ink pen or even a thin felt tip. Pencil might be good too. I think it would be really tricky to use multiple colours without a desk available, and it would take my focus off the talk. I’ll definitely be back for DDD Brisbane next year if I can get a ticket! They sell out lightning-fast, and this year the only reason I was able to attend was thanks to Emvious – a community for women in STEM. I was awarded a ticket from their pool reserved for underrepresented folks in tech and I really appreciated this opportunity. I was really impressed by the amount of women both speaking and attending this conference, and it was clear that the organisers had done a lot of work to get this to happen. One of the things they did was a gender-blind program (instead of writing “Vanessa Love” they would write “V. Love” so it’s harder to tell the gender of the speaker). One male attendee later tweeted that he was happy to say that he ended up watching 100% female talks by the end of the day, purely by choosing by topic! Another thing that impressed me was the efforts in environmentalism. All of the plates, cups and cutlery were compostable and there were compost and recycling bins around everywhere. The swag bags were really cool – they were all handmade from cloth scraps and each one looked unique. There was a prize draw for anyone who brought a keep cup instead of using a disposable coffee cup. Lanyards were collected for reuse at the end of the day. Lastly, the software developer community itself was really great. The talks were mostly voted-in and it was awesome to see so many talks that made it through on topics like diversity and design. I’ve been hanging out with this crowd on Slack for a couple of years now and for the most part have found it to be a really welcoming and friendly community.